Create your own Brother Intellifax 1860C inkjet pack / bundle with our flexible quantity discount pricing. Mix and match products so you are only purchasing what you need, but also maximizing your savings. Compatible Cyan Ink Cartridge with 400 page yield. Equivalent to Brother part number: LC51C. Fits the following model(s): Brother 1860, Brother 1860C. Compatible Magenta Ink Cartridge with 400 page yield. Equivalent to Brother part number: LC51M. Fits the following model(s): Brother 1860, Brother 1860C. Compatible Yellow Ink Cartridge with 400 page yield. Equivalent to Brother part number: LC51Y. Fits the following model(s): Brother 1860, Brother 1860C. Compatible Black Ink Cartridge with 500 page yield. Equivalent to Brother part number: LC51BK. Fits the following model(s): Brother 1860, Brother 1860C. Buy our high quality compatible ink for Brother Intellifax 1860C with confidence. Join thousands of happy customers who have found our compatible products are equivalent in page yield and print quality. For our compatible products, we offer a 100% Satisfaction Guarantee allowing you to return products within 6 months if you are unsatisfied. The Brother Intellifax 1860C is a color and monochrome fax machine that supports color copying and is an ideal fit for small or home offices. Expert reviews have many positive things to say about this inkjet device, testing it to quickly send a fax page in a fast as 3 seconds and copy documents at a maximum speed of 18 pages per minute. While users may want to spend a little more on a device like the Intellifax 1960C for its inclusion of a cordless phone and answering machine, the 1860C is still an impressive addition to its class of fax machines, and has a low price tag and easy-to-use features. The unit offers the convenience of multitasking with its dual access technology, which will allow users to scan faxes to memory while the machine is already occupied with another job. With 16 MB of memory, the device can store up to 300 fax pages to memory for times when users are either busy or Intellifax 1860C printer ink has expired. 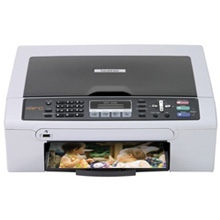 While it is primarily designed for faxing and copying, the unit's USB port makes it possible to use it as a printer for occasions when users need to print documents from their PC. The 1860C has a flexible front panel design that will allow users to perform functions such as set up to 100 speed dials on the number pad, automatically redial a number, and copy up to 99 pages from an original document. The panel's monochrome LCD will also keep users up to date on job progress, while its LED will flash to notify when the Brother 1860C printer ink needs to be replaced. The build also includes a 20-sheet automatic document feeder for quickly faxing, scanning, or copying large projects. Documents copy with a satisfactory output that mirrors the quality of the original document, with a resolution of 600x1200 dpi using color Intellifax 1860C ink. Since each black, cyan, magenta and yellow Brother 1860C ink cartridge is packaged separately, supplies will be relatively inexpensive to replace. Each color supply has a capacity of 400 pages and the black Brother 1860C ink cartridge can last up to 500 pages, making this unit suitable for low volumes. 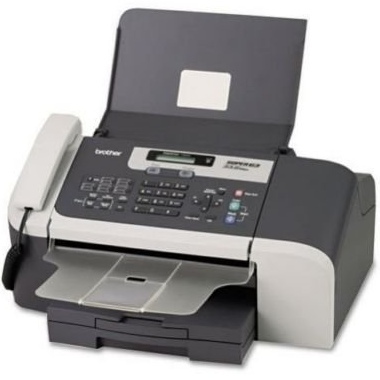 The 1860C is designed to provide home and small office users with the necessary fax and copy features to support their basic light-duty needs. While it may be more simplistic than other inkjet models in its class, this device has the low running costs and quick speeds to make it a good value for the price.